Trust the Gold CDT Seal! CDT Customers, make sure your purchase is at an AUTHORIZED ON-LINE DEALER! 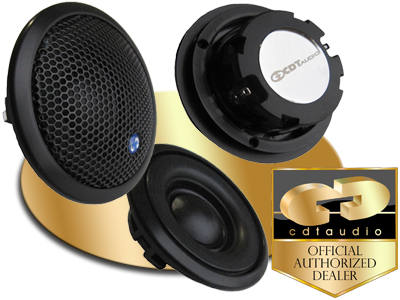 Always look for the CDT Authorized Product/Dealer Seal when buying CDT Audio Products On-Line! CDT Audio has not become the preeminent manufacturer of audiophile speaker systems by chance. Our success is due to critical control over every step of the production process, from conceptualization to delivery of the world's finest audio components into your hands. CDT Audio entrusts a few internet dealers who share their vision to sell their products, and we urge you to purchase our products only from these dealers. Sounds Great and WoofersEtc, are the ONLY two authorized dealers on eBay and Amazon. CDT AUDIO will not honor warranty on items purchased on eBay & Amazon from any other dealer. Do Not Be MISLED BY UNAUTHORIZED DEALERS! Cannot offer factory warranty service on CDT Audio products, regardless of what they say or imply. 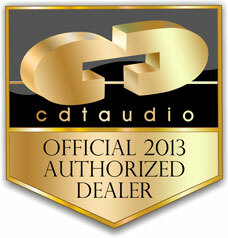 If you do not buy from an authorized CDT Audio dealer, you do not have a CDT Audio warranty. Cannot guarantee our most recent innovations, found only in the 2013 CDT Audio authorized product lineup. May be offering discontinued versions of CDT product, refurbished, used, or otherwise distressed CDT Audio products, including products developed for overseas consumption, which may not be manufactured to the same standards as products intended for domestic consumer consumption.